I’d not heard the name Martin Braun prior to this year’s Basel Fair, but once there, I heard it many times. Friends said “You’ve got to see Martin Braun – Hall 5″. And so I went, and on March 26, I was fortunate enough to have 30 minutes of Martin’s scarce time. I say scarce because he was obviously very busy: taking orders, interviewing distributors, and greeting fans, including Mr. Kiu Tai Yu. An auspicious beginning for a young watchmaker attending his first international watch fair. Above, Martin Braun with some of his creations. The story begins with Martin’s father, Karl Ch. Braun. 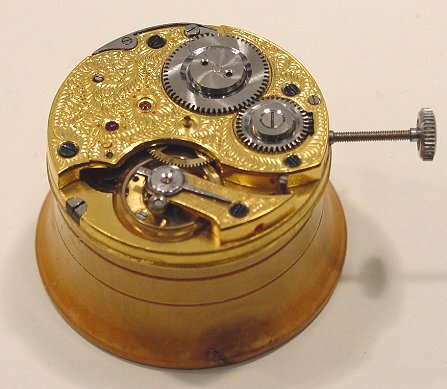 Karl’s company is known as CCM-Braun, and there he restores and re-cases antique watch movements, often converting pocket watches into wrist models. 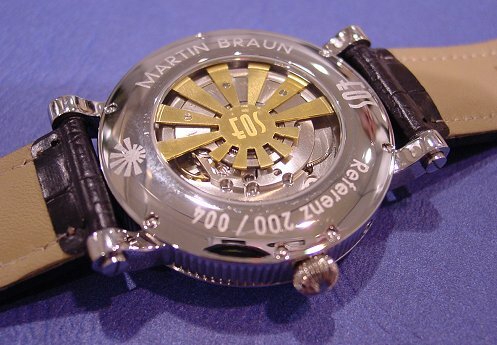 The timepieces CCM-Braun creates are beautiful and strictly one-of-a-kind. To the right is a restored pocket watch movement from the CCM-Braun display. 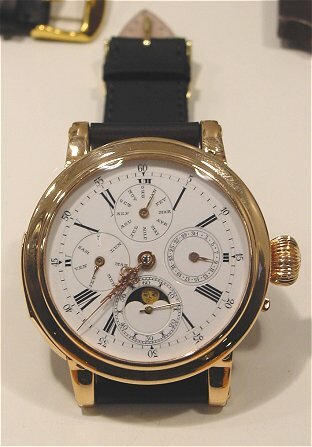 Below is a massive wristwatch CCM-Braun created by re-casing a pocket watch movement and dial. Martin Braun was born in 1964. His formal training began in 1980, at the well-regarded watchmaking school in Pforzheim, where he studied for three years and graduated with honors. In 1986, he joined his father’s company, where he gained his most valuable experience. 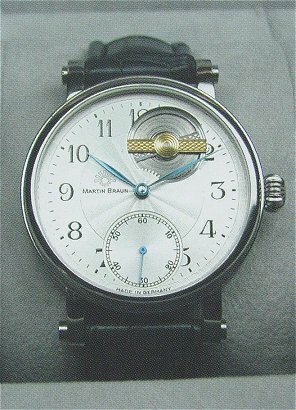 Martin notes that restoring vintage movements and watches is perhaps the best practical training a watchmaker can have. It provides daily contact with fine craftsmanship in the old style. He often had to create new parts from scratch. 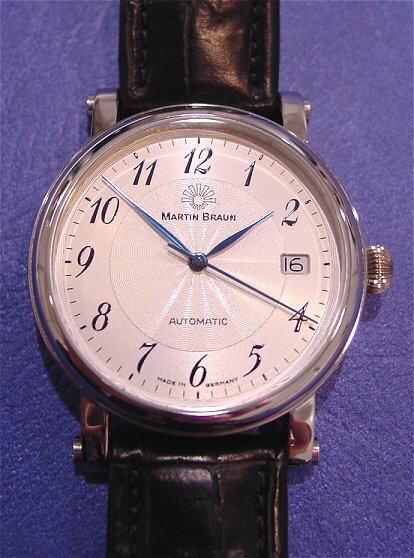 In 1989, Martin returned to the watchmaking school in Pforzheim to study for his Master Watchmaker certification, which he received. Thereafter he worked briefly for Omega. But Martin realized that his father would retire one day, and Martin wanted to start his own company to assure that he could continue as an independent watchmaker creating distinct timepieces. And so the company bearing his name was born. 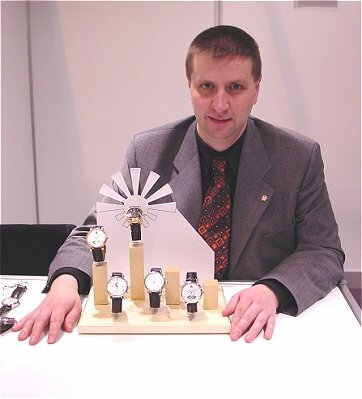 Martin’s small company produces several models, but his signature piece, which generated substantial buzz in Basel, is the Eos, with sunrise and sunset display. Eos is the Greek goddess of the dawn, and so an apt name for this watch. Martin had the idea to create a sunrise – sunset display several years ago. He says his idea for his patented mechanism came from work on both perpetual calendar and minute repeater movements. Three years of thinking, one year of calculations, and 2 more years of experimenting went into creating this piece. The Eos is shown below, and you may click on the image to see an enlarged version. In the image above, sunrise is displayed on the scale at 9, which shows the time from 3:30 to 7:30 a.m., and sunset is shown on the scale at 3, showing 4:30 to 10:30 p.m. There are 5 different dial scales available, as well as different disks to hold the sunrise/sunset hands, to account for the owner’s latitude. The long hands constantly move up and down, showing the time of sunrise and sunset. However even with the different dials and disks, the Eos is unable to account for the effects of government-imposed daylight savings time. 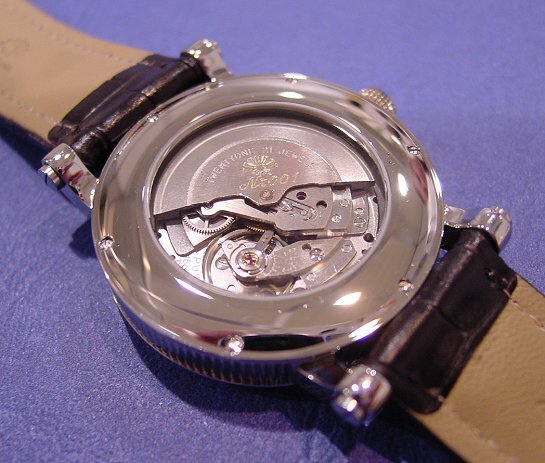 Martin expects to begin serial production of the Eos in August or September, using the Progress caliber 152 movement. A view of the back of the Eos is shown below. Note the unique rotor shaped in the form of the Eos logo. With the help of his two assistants, Martin’s atelier should be able to achieve a total annual production of 1500 to 1800 pieces, including all models. The Eos will be available in steel or red, white or yellow gold, with silver or black dial, in 39 or 42 mm case, and with diamonds on the bezel if you please. As of our conversation on March 26, USA retail prices had not been determined. 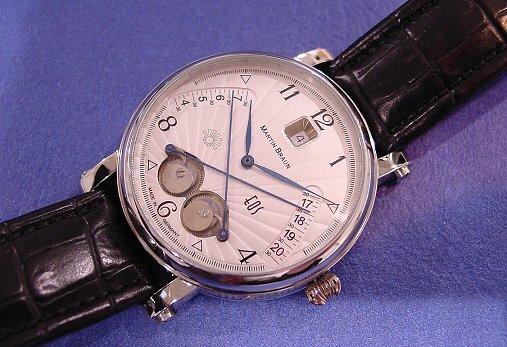 Martin Braun’s other models include the La Belle, shown below, which uses a beautifully hand-engraved ETA/Unitas pocket watch movement 6498. The La Belle’s display back exposes the beautifully engraved Unitas cal. 6498. Another of my favorite pieces is a model known as the Teutonia, shown below. It is a simple and elegant automatic dress watch using the last automatic movement produced in the old West Germany, the PUW caliber1564. The Teutonia’s display back reveals the PUW cal. 1564 automatic movement. It was a pleasure spending time with Martin. 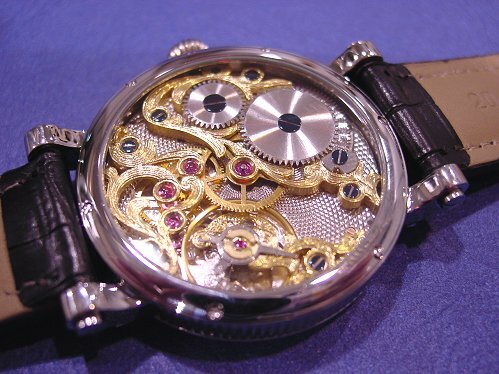 He has a genuine passion for distinctive and creative watchmaking that should earn him many followers. We’ll be hearing more from Martin Braun in the years ahead.